Audio Tonic closes its summer release schedule with the ‘80s-influenced house of Bodden and his ‘First Movement’, backed with a remix from Hot Creations man Miguel Puente. Cadiz, Spain-based producer Bodden aka, Javier Paz Castellano, made his debut as a producer via Dubai’s Audio Tonic imprint back in April, where he returns to here, slotting in alongside the likes of Kyodai, Kruse & Nuernberg, Sasse and Nikola Gala. The release opens with title cut ‘First Movement’, a contemporary deep house workout employing bumpy drums, drawn out saw-wave bass tones and bright digital strings as its driving force, while sporadic male vocals and a stabbing synth hook adds charm and character. Following on is the second original track on the package, ‘Reflections’, where Bodden delves a little deeper this time with hooky disco guitar licks, ethereal pad lines and low-slung drums. These elements are maintained throughout the track’s just over seven minute duration, while evolving bass hits, and retro resonant synth lines put things on an ‘80s tip. 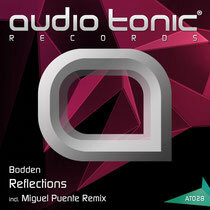 Closing the single, Miguel Puente reshapes ‘Reflections’, a nice remix and a decent way to round off the package. It’s out now.